Finding cool Nissan Juke accessories to help decorate the car is something special indeed. Accessories for Nissan all tend to be either cool, like chrome finishes, or practical, such as performance chips. Choosing the right kind of accessory will help the user to get the most from their car, and make it look cool and stand out from the other cars on the road. Drivers and passengers sometimes want to put their arms down on something. 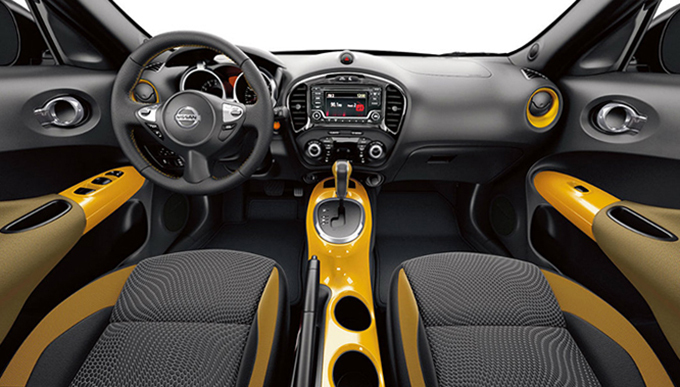 Passengers in particular will appreciate the addition of a Nissan Juke armrest, and it can also be used as an extra storage compartment by the driver’s left hand. Care for the Nissan Juke with a kit which is designed to ensure that it still looks as it did when it came from the showroom. Sponges, waxes and oils are all provided to allow the owner to keep the car in mint condition, and ensure that all scrapes and scratches are eliminated. Drivers can look cool while taking care of their car with the hood deflector. This device is intended to protect the front of the car from stones, debris and insects which might otherwise hit the hood or window of the vehicle. Drivers who want to be cool consider wheel rims to be one of the most important Nissan Juke accessories they can buy. Rims can be bought in a variety of colors, including Chrome and alloy, depending upon the style the owner is looking for. Sometimes it is difficult to reach the very top of the vehicle roof, either while fitting a roof rack or while cleaning. This is what the Nissan Juke tire step was invented for, allowing users to slot a metal support into the tire rim, and use it to support their weight while they get to the middle of the roof. Going beyond the standard OEM Nissan parts is the styling plate fitted to the back of the Juke, it helps to keep the car safe from debris in the road, although it is not suitable for fitting with a tow bar. This accessory contains everything that is needed to start a new car and keep it looking good. Bulb and fuse replacements, a car pack, and velour floor mats are all designed to help the driver keep the Nissan Juke interior and exterior looking good. These little Nissan Juke accessories are designed to add a little something to the vehicle. Made of chrome, they fit over the fog lamps and give them additional style and attraction. The silver color can also help with the light emitted from the fog lamps. These are the latest little gadget, and are designed to help the Nissan Juke performance parts improve power, and deliver more to the driver. They can sometimes be quite expensive. Most cars come with this product, but it fits onto the inside of the truck, and helps provide an extra layer of storage for the car.